Get all the need-to-know info below... and CLICK HERE FOR ALL THE EPISODES! It’s an all-audio show that you can listen to whenever you want, from your phone or computer (or just ask Alexa!). Think of it like on-demand talk radio with your favorite host. You can listen to podcasts for free. Subscribing is optional and won’t cost you a thing... but it WILL keep you up to date on the latest episodes! What can I expect from the Hungry Girl podcast? ⭑ Food finds, supermarket staples & more! What’s the best way to listen on my iPhone? Open the Podcasts app. Search Hungry Girl. 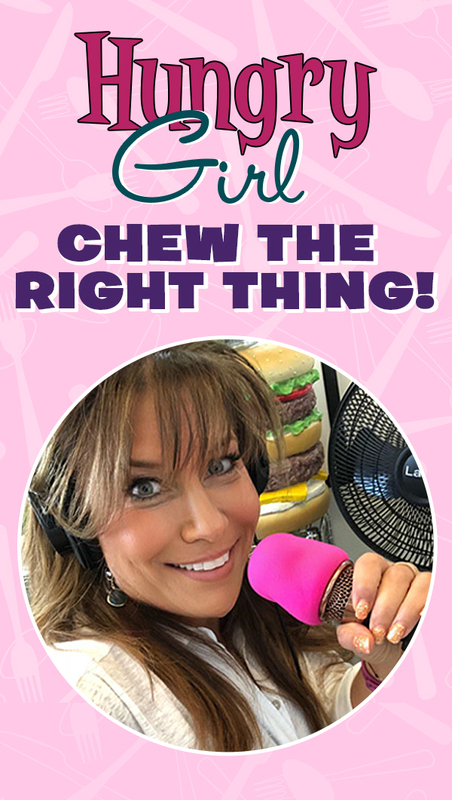 Select the Hungry Girl: Chew the Right Thing! show. Or just click here from your iPhone, and it will open automatically! Download and launch the Google Podcasts app. Search Hungry Girl. Select the Hungry Girl: Chew the Right Thing! show. Or if the app is already downloaded, just click here from your Android phone or tablet, and it will open automatically! Have more questions about the Hungry Girl podcast? Click here to send us your questions or feedback!